I woke up to snow....in April and it has dampened my mood. I'm missing the spring season and so very tired of bitter cold, long underwear and my winter coat (which I'm wearing my old one because the brand new one that I got for the winter season, the zipper busted). The only good of the day comes that today is National Unicorn Day! I didn't even know that unicorns get their own day so head over to our Facebook page today where I will be sharing random unicorn stuff. Last week concluded our Blended Tales series with Darlene's story about the trauma of her apartment fire. Click on her story down below and be sure to catch up on all of the stories from Blended tales on our website! 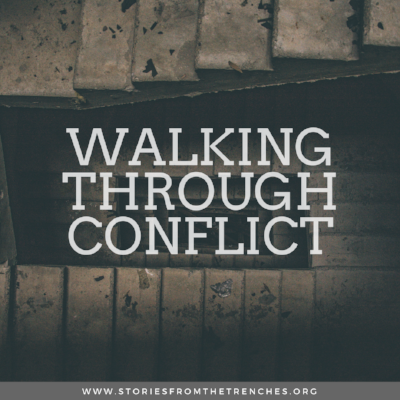 Walking Through Conflict series begins this week. Our hope was to bring you a series of stories about the times we are in conflict within ourselves, with others or even with the world. Stories that share the battle, the hardships and the resolutions that come from conflict. We begin the series with two of our Content Authors - Missy & Jess. I know you will identify and understand their battles so please be sure to comment and interact with the authors this week! We still need two more Conflict stories! All stories regarding the theme of conflict are welcome! You can submit your story at www.storiesfromthetrenches.org/stories or email me with any questions at jen@storiesfromthetrenches.org. Join our new Trench Community Facebook Group where you can engage, connect and interact with Trench Sisters. This group will be replacing our previous website forums but will continue to be a private group. Request to join the Trench Community here. When you join, be sure to reread our terms and policies for the group. Also please just jump into the conversation, don't be shy! Ask questions, post comments, share concerns. Our goal is create a community that leans into one another through the good, bad and ugly. Join me for our next Facebook Live on Sunday, April 22nd at 8:00 P.M. Central Time. I will be chatting about our conflict series, new Facebook group and upcoming stories series. I'm still healing from left thyroid removal surgery. My voice still isn't completely back to volume which was a problem last week when no one in the lunchroom could hear me yell for line up. My whistle got a good work out though so I could get their attention. My energy level is still lagging so I've been binge watching one of my all time favorite tv series (again), Friday Night Lights. What do you binge watch when you are sick?